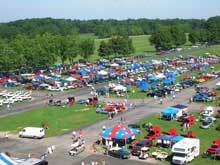 The dates for the upcoming event are August 2, 3, and 4, 2019...we hope to see you there! 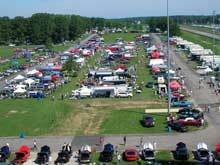 This is the 10th consecutive year that the Ames Performance Tri Power Pontiac Nationals has achieved the distinction of being the largest brand event held at Summit Motorsports Park, beating out all other brand shows at this world-class facility! 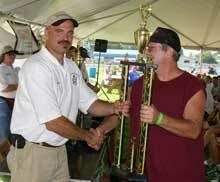 We want to thank all of our sponsors and participants for their continued support of the event. 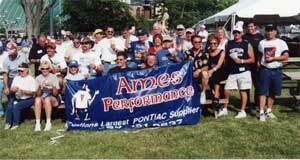 It has been a longstanding tradition at Ames Performance that you, our customers and show participants, should share in our success. This photo review of complementary activities illustrates how we try to "give something back" to those that support this event and Ames Performance. 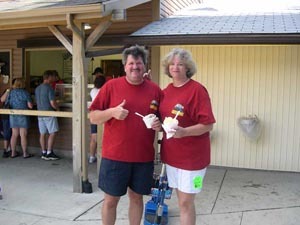 Ice Cream - Ice Cream - Ice Cream - Free this couple loved it. - Everyone loved it. 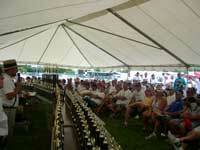 We were able to give away 1500 pounds of the "good stuff" to appreciative participants. 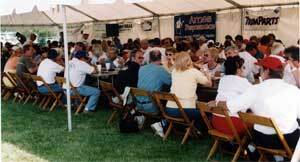 Saturday Evening Supper - Our tent was filled at each buffet setting. 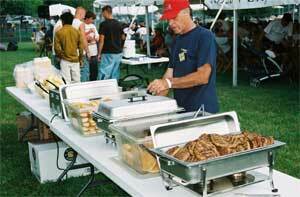 We fed over 900 people in 2006! 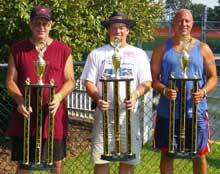 The show has grown so large, we felt our "Best-of-Class" winners deserve these beautiful 3 1/2 foot trophies - can 10 footers be far behind. 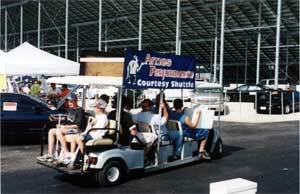 Our free shuttle service has been immensely popular for many years. 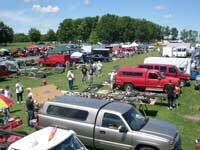 In 2006, we doubled the available vehicles for everyone at the show. 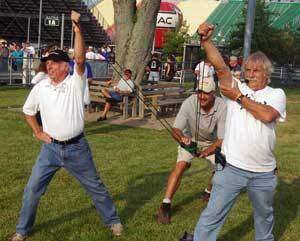 Fun to be had by all at Norwalk. 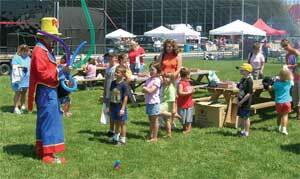 Here, POCI the clown, entertains future Pontiac enthusiasts. 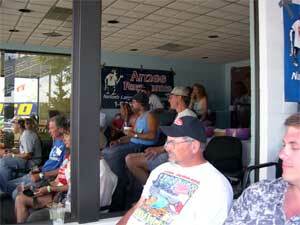 Again in 2006 over 800 free air-conditioned suite passes over the starting line where made available to our participants and guests. 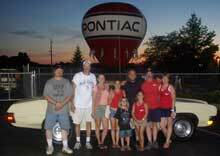 It's late Sunday - Practically everyone's gone - The nations largest Pontiac show is over and Doug and Matt are pondering ideas on how to fit the remaining parts into the trailer for the trip home. 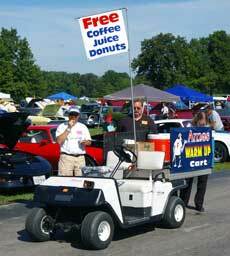 At Norwalk 2007, two Ames Cool-Down Carts and Warm-Up Carts offer free coffee, juice, donuts, cookies, etc. throughout the weekend. 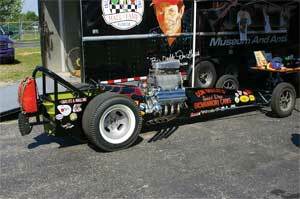 "Big Daddy" Don Garlits was on-hand singing autographs and displaying the Swamp-Rat 1B Dragster. 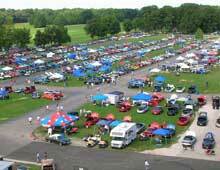 Even this aerial photo was unable to capture the full extent of the 900 car event. 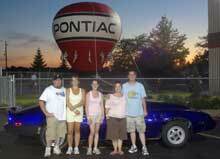 The participants on the right side of the track were parked all the way to the end of the shutdown area. 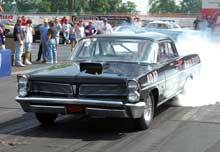 Milt Schornack was on-hand with a beautiful re-creation of the legendary Royal-Pontiac GTO. What a Car! 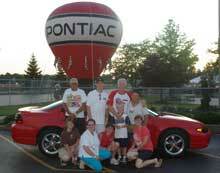 Pontiac Motor Division has always been a wonderful addition to our show. 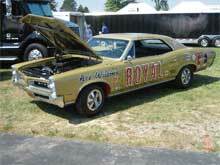 This year they provided a full complement of new, prototype, and race Pontiacs. 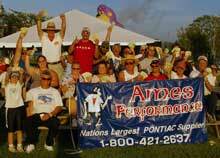 The 2006 swap meet may have been the largest "all Pontiac" swap ever! 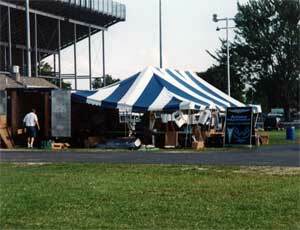 Extra spaces had to be continually added throughout the event. 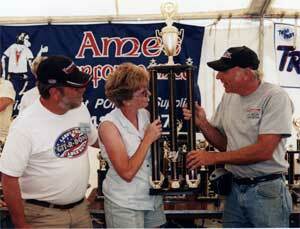 Contact webmaster@amesperf.com with questions or comments regarding this site. Copyright 2015 Ames Performance Engineering.